#rshyr – Irish crewed yacht Breakthrough is an estimated two hours off the overall handicap lead at the halfway stage of the 635–mile Sydney–Hobart yacht Race. Lead by top Irish offshore sailor Barry Hurley, the New South Wales entry from Jonathan Stone and Mathew Vadas is lying 33nm SE of Gabo Island in third place in the 109–boat fleet. After its second night at sea Breakthrough has still to sail 382.5 miles to the Tasmanian finish. Hurley has on board Dublin Bay sailors Alexander and Kenneth Rumball and Catherine Halpin along with a local Sydney crew. 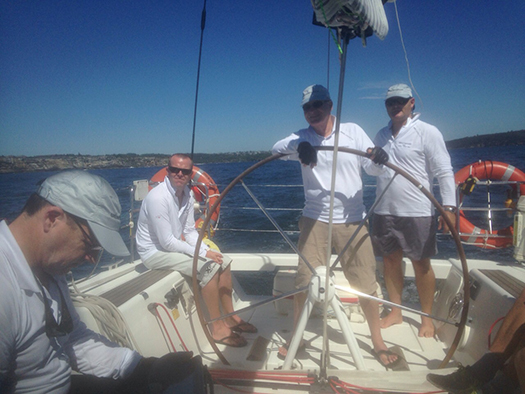 The Aussie–Irish team are currently behind Roger Hickman's Wild Rose and Ron Foster's Ariel on IRC handicap. Prior to his departure Hurley wrote about preparations for his third successive Sydney–Hobart race.